Last week, on Wednesday 11th April, Ireland’s top travel writers and bloggers gathered in Dublin for the 2018 French Travel Media Awards, awarded by Atout France. 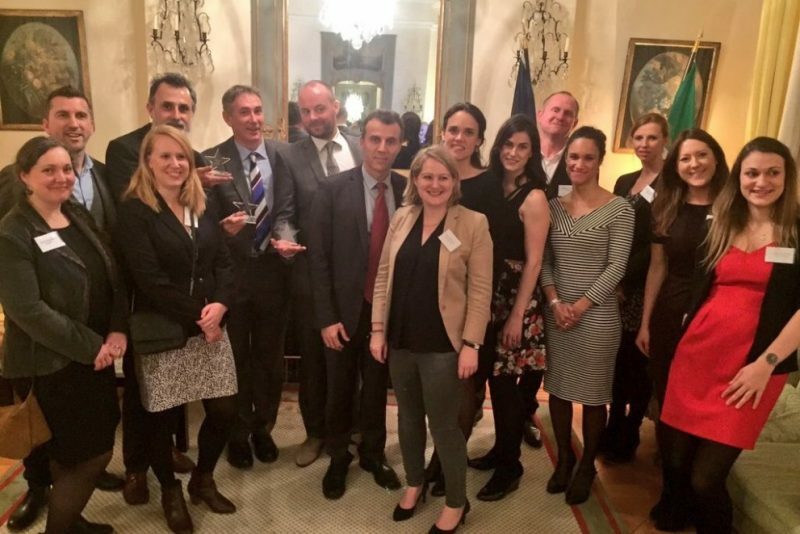 Hosted in the opulent surroundings of the French Ambassador’s Residence, the annual awards event recognised the work of journalists, broadcasters and bloggers that have stood out in covering France during 2017 as a world-class destination. Over 40 journalists and bloggers submitted almost 70 pieces of work for consideration including blogs, videos, radio features, TV programmes, magazine features and newspaper features. Attendees also included representatives from a number of French attractions and destinations including Normandy, Pays de la Loire, Nausicaa, Occitanie, Montpellier, Aveyron, Carcassonne, Toulouse, Pyrénées Orientales and Perpignan. There were five categories in all (see full list of awards below) Tootlafrance and/or Conor Power were nominated in three of them, coming good in the final prize of the night – that of the Best Destination Feature. The other nominated articles from the Tootlafrance stables were Assassin’s Creed Tour of Paris and Biscarosse – a Teenagers’ Paradise. A magnificent buffet was laid on for the occasion and there were plenty of new faces, starting with the recently-appointed Ambassador Stéphane Crouzat and his wife, as well as the new Press Officer for Atout France UK, Marine Teste. The London office has been looking after the promotion of France in Ireland since the French national tourism agency closed its offices suddenly in 2010. At the superb presentation on upcoming events in France in 2018 (by both HE Mr Crouzat and Anne Pedersen of Atout France), a quick scan of the statistics revealed a French tourism industry still at the top of the global game but with a significant drop in the numbers of Irish visitors in 2017. Perhaps it’s time to re-open that office in Dublin?